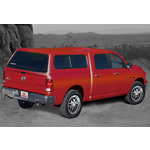 The Raider Vagabond is today's value leader for truck caps. 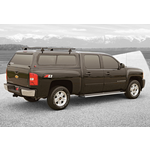 Our most popular cab hight truck cap features full size 50-50 side sliders, a front picture window, a solid aluminum framed rear door, trimless edge (available on most units- please see dealer for details) and our Lifetime Buckstopper Warranty. With many options available you can tailor the Vagabond to meet all of your lifestyle needs. 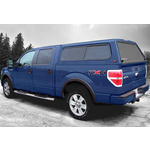 One of our most popular options on the new 2004 - current Ford F-150 - the all glass rear door - is a must have for your ford truck.